The heart of mathematics is its elegance; the way it all fits together. Unfortunately, its beauty often eludes the vast majority of people who are intimidated by fear of the difficulty of numbers. Mathematical Elegance remedies this. Using hundreds of examples, the author presents a view of the mathematical landscape that is both accessible and fascinating. At a time of concern that American youth are bored by math, there is renewed interest in improving math skills. 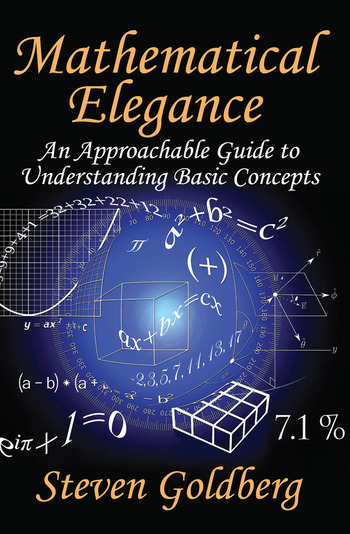 Mathematical Elegance stimulates students, along with those already experienced in the discipline, to explore some of the unexpected pleasures of quantitative thinking. Invoking mathematical proofs famous for their simplicity and brainteasers that are fun and illuminating, the author leaves readers feeling exuberant—as well as convinced that their IQs have been raised by ten points. A host of anecdotes about well-known mathematicians humanize and provide new insights into their lofty subjects. Recalling such classic works as Lewis Carroll's Introduction to Logic and A Mathematician Reads the Newspaper by John Allen Paulos, Mathematical Elegance will energize and delight a wide audience, ranging from intellectually curious students to the enthusiastic general reader. 8 A Short Math Miscellany and a Final Thought . . .